Hilton Head Island Accommodations - Guide to Hilton Head Hotels, Resorts, Vacation Homes, Inns, Motels, Villas, Rental Properties, Condos, Apartments and Places to Stay on Hilton Head Island, SC. Guide to Hilton Head Hotels, Resorts, Vacation Homes, Inns, Motels, Villas, Rental Properties, Condos, Apartments and Places to Stay on Hilton Head Island, SC. Hilton Head Island is comprised of 11 primary "plantations" that subdivide the island into smaller territories, incluing Hilton Head Plantation, Palmetto Dunes Plantation, Port Royal Plantation, Sea Pines Plantation, Shipyard Plantation, Palmetto Hall Plantation, Long Cove Plantation, Indigo Run Plantation, Wexford Plantation, Spanish Wells and Windmill Harbour. Other areas of import are Shelter Cove Marina, Skull Creek Marina, and Harbour Town, home of the infamous Harbour Town Lighthouse which serves as the island landmark and trademark icon. Within each of these areas, you'll find extraordinary accommodations, restaurants, shops and attractions full of Southern charm and hospitality. Through our partnership with Booking.com, we've made it easy and affordable for you to find and book a hotel room, vacation home, condo or rental property right here on our website, with the guaranteed best available rates and locations on Hilton Head Island. Situated oceanfront in Hilton Head Island's Palmetto Dunes, the spectacular resort offers airy rooms with balconies and free Wi-Fi in a modern resort offering 3 golf courses, 2 pools and a spa. This hotel is located oceanfront on Hilton Head Island, with a sandy beach and amazing views. Settle in to our spacious accommodations featuring private balconies with coastline or resort views, plush robes and premier bath items. Luxury amenities include three golf courses, a fitness center, tennis courts, indoor and outdoor pools. Enjoy watersports at our luxury resort or go cruising on a rental bike. Make use of complimentary Wi-Fi in our transformed modern lobby as well as all public areas of our hotel. Stop by our signature spa where you'll find a full slate of rejuvenating spa services. Savor a fine dining experience at Blue or enjoy any of our casual and delicious indoor or al fresco dining options. Elsewhere in the hotel, discover 46,000 square feet of versatile indoor and outdoor venues ideal for meetings or special events. The modern rooms feature desks, free Wi-Fi and flat-screen TVs with cable channels, plus minifridges and coffeemakers. Room service is offered, and kids 19 and under stay free with an adult. Amenities include an on-site, Southern-style restaurant (where kids 12 and under eat free), legendary Tiki Hut beach bar, an outdoor pool, and business and fitness centers. Meeting space is available. Experience the only true oceanfront boutique resort on Hilton Head Island, just named "The South's Best Beach Town 2019" by Southern Living. Complete with oceanfront guestrooms, live music all year-round at Tiki Hut, and Lowcountry dining at Porch Southern Kitchen & Bar, it's no wonder Beach House is one of the most desirable hotels on Hilton Head. Our beachfront Hilton Head Island hotel is located along the most enviable strip of South Carolina shore, steps away from Coligny Beach and a few miles from 13 championship golf courses. Only steps to the pool, the beach, professional beach volleyball courts, and of course, the legendary Tiki Hut beach bar. Oceanfront resort hotel offering suites with kitchens and free Wi-Fi, plus 2 pools and a gym. Features an extensive spa, a state-of-the-art gym and an outdoor swimming pool with a seasonal water slide. The rooms at the Marriott's Barony Beach Club include a fully-equipped kitchen, a seating area with cable TV and a private bathroom. Guests can enjoy massages, body scrubs and facial treatments at the European Spa. The Barony Beach also has a fitness center with cardiovascular equipment and free weights. 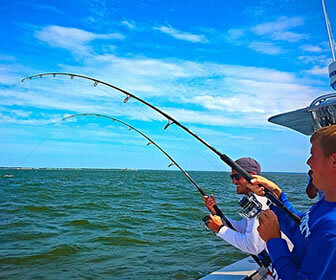 Located within the acclaimed Port Royal Plantation, this hotel is surrounded by a range of recreational activities, including biking trails and numerous water sports. Only steps from the waterfront on beautiful Hilton Head Island in South Carolina, these apartment-style accommodations feature fully equipped kitchens. The hotel includes a seasonal outdoor heated pool and hot tub. The accommodations at Marriott's Harbour Club provide private balconies and free Wi-Fi. They are furnished with separate living and dining areas and the bathrooms include spa baths Harbour Club Marriott includes a gym and barbecue facilities. Guests can also use the picnic area. Harbour Town is within a 5 minute walk from the hotel. Restaurants and golfing at Harbor Town Golf Links are also a short walk from Marrott's Harbor Club. Recently renovated, the Omni Hilton Head Oceanfront Resort has been transformed, including the front entrance, lobby, meeting facilities, fitness center and Ocean Tides Spa. Outdoor areas are revitalized including beach access and pool access, updates to both the upper and lower courtyards and the addition of another great fire pit near the HH Prime deck. The whole family will enjoy the new kid's splash zone along side our amazing new 3,600 square feet, zero entry Family Pool. Of course, our guests traveling wtihout kids, may want to choose our newly renovated Adult Pool for some peaceful rest and relaxation. Nestled in the middle of our new pool complex is the beautiful new Buoy Bar. Order your favorite beverage and something from our extensive menu while taking in magnificent views of the Atlantic Ocean. With all the beautiful renovations, we have maintained the lavish, sub tropical landscaping and exotic garden atmosphere that has long been the signature of the resort. This relaxed hotel is 0.9 miles from Long Cove Golf Club and 2.3 miles from the beach. Casual suites have free WiFi, TVs, private balconies, dining areas, and full kitchens with microwaves and coffeemakers. Some offer pull-out sofas and/or fireplaces. Freebies consist of continental breakfast, daily newspapers and 24-hour coffee in the lobby. Other amenities include an exercise room, an outdoor pool with a hot tub and 2 tennis courts, plus a business center. Laundry services and bike rentals are available for a fee. Relax and unwind at our oceanfront resort. Upscale resort with modern dining and bars, plus 3 outdoor pools, a day spa and direct beach access. Rejuvenate your mind and body at Heavenly Spa by Westin, feed your soul with low country cuisine and discover the finest Hilton Head has to offer. Enjoy private beach access, three beautiful swimming pools and four on-site restaurants. Children will love spending time at the Westin Family Kids Club, while you can escape to the Heavenly Spa by Westin™ for a rejuvenating massage. 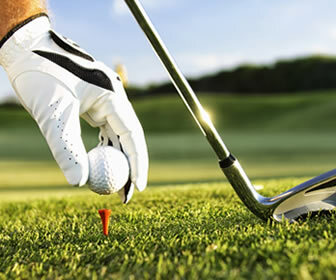 We also offer hotel guests access to the adjacent Port Royal Golf & Racquet Club for championship golf and tennis. For meetings or weddings on Hilton Head Island, we offer 39,000 square feet of flexible venue space, including our newly-opened Grand Ocean Terrace, which boasts sweeping ocean views. For a complete listing of Hotels & Resorts on Hilton Head Island click here. The 2-bedroom apartment is equipped with a living room with satellite flat-screen TV, and a fully equipped kitchen with dishwasher. A full size washing machine and dryer are provided. 2 full bathrooms are included. The property has a hot tub. An outdoor swimming pool is available on site and fishing can be enjoyed within close proximity of the apartment. Surrounded by subtropical gardens, this upscale resort offers direct access to a white sand beach. It's 0.9 miles from Shipyard Golf Club. Contemporary rooms feature free WiFi, iPod docks and flat-screen smart TVs, plus Keurig coffeemakers and minifridges. All have balconies or patios, while some offer ocean views. Suites add wet bars and living areas, and 1 features a whirlpool tub. Dining options include a refined Lowcountry restaurant, an outdoor bistro and 2 bars. There's a hot tub, an outdoor pool and a sundeck with cabanas, plus a 24/7 fitness center and a day spa. Bike rentals and access to nearby tennis facilities are available (fee). Located on Hilton Head Island, some of these spacious villas include access to 2 outdoor pools and an indoor pool. Guests can lounge on the private beach, and Hilton Hidden Mall is 2.5 mi away. Free WiFi is provided. A fully equipped kitchen, balcony, and 2 flat-screen cable TVs are included and a separate seating area. Guests can play a few matches on the tennis court and have access to a fitness center on site. Guests can take advantage of the launderette as well. Free parking is provided. The property provides daily complimentary passes to local golf courses, bike rentals, miniature golf, and nature and scenic cruises for each night's stay. Soak up the sun and surf on world-famous Hilton Head Beach. Indulge in championship tennis where you'll find 10 lighted courts, a pro shop and an on-site tennis pro to help you with your game, or you can relax at Hilton Head Island's largest oceanfront pool. Enjoy your private beach or tennis villa with everything you need to make your stay as relaxing and enjoyable as possible including a full kitchen, free high-speed WiFi, separate bedrooms and living areas, cable TV and DVD player. The villa features 2 bedrooms, a living room with a flat-screen TV, an equipped kitchen, and a bathroom with a bath and free toiletries. Tennis court and free WiFi is available. The villa has an outdoor pool. For a complete listing of Vacation Rental Homes & Villas on Hilton Head Island click here. The newly renovated Best Western Ocean Breeze Inn, is nestled in the heart of Hilton Head Island. Just a short walk from the hotel will take you to the world famous Coligny Beach. The convenient on-site bike rentals will allow you explores the miles of dedicated biking trails. Learn to play tennis like a pro, just next door at the 17 court Van Der Meer Tennis facility. Location is everything from this stunning new property. Coligny Plaza is a short distance away and offers over 60 restaurants and retail shops. The Island's best known and best loved landmark, Harbour Town Lighthouse and Marina is only 10 minutes away. Amenities include spacious comfortable accommodations; the lightning fast 200 mb fiber optic internet will appease all family members with their various gadgets. The 48-inch LED TV and state of the art on demand movies and virtual DVR offers thousands of entertainment choices. Fully equipped kitchenette units are available for those seeking a longer stay or just like the convenience of a kitchen. With its comfortable suites, complimentary continental buffet breakfast and plentiful amenities, the Comfort Suites Bluffton is an ideal destination for vacationers and business travelers alike. And when you're a guest at the Comfort Suites Bluffton, you'll find that quality and convenience are standard when it comes to fine dining. There's no on-site restaurant or lounge but you'll find several within walking distance and many just a short drive away. Set in a 3-story property on the 278 loop, this casual hotel is across the street from Pirate's Island mini-golf and 1.4 miles from the beach. All rooms and suites include en suite bathrooms with showers and tubs, plus free WiFi, TVs, desks, microwaves, minifridges and/or tea and coffeemakers. Some upgraded rooms and suites have balconies. Suites add separate living areas. Kids 17 and under stay free with a paying adult.A complimentary continental breakfast buffet is provided. There's also a heated outdoor pool, an exercise room and a business center, as well as free parking for RVs and buses. 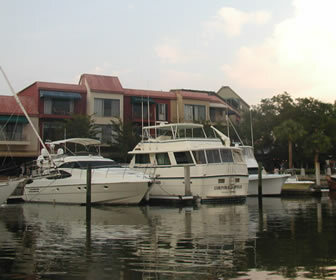 Located on Hilton Head Island in South Carolina, this hotel is adjacent to Hilton Head Airport. It features a breakfast buffet and rooms with free Wi-Fi. Guests will be 5.5 mi from Hilton Head Plantation, 12 mi from Pinckney Island National Wildlife Refuge, and 49 mi from Parris Island. Every spacious room at the Hampton Inn Hilton Head is furnished with a flat-screen TV and coffee maker. All rooms are warmly decorated with carpeted floors and include a microwave and refrigerator. Free access to the gym and seasonal outdoor pool is provided to all guests of the Hilton Head Hampton Inn. A business center and free on-site parking are also available. Surrounded by majestic pines just off island at the crossroads of Hwys 278 and 170. Enjoy high-speed wireless Internet access, continental breakfast, in-room coffee, and our outdoor pool and spa - at surprisingly affordable rates. Within steps of the beach, the Inn is just a few minutes walk from Harbour Town. Enjoy close proximity to numerous golf courses, access to 2 swimming pools and a full-service spa. The spacious guestrooms are beautifully decorated with custom furnishings and marble soaking tubs. Guests are ensured a comfortable stay with Harbour Town's 24-hour friendly butler service. Red Roof Inn Hilton Head Island is 2 miles from public beaches. Relax in the refreshing outdoor swimming pool! But first, experience our coffeehouse-style coffee and tea in the lobby. Seasonal complimentary continental breakfast served daily from Memorial Day to Labor Day. Located across from the Palmetto Dunes Plantation, Red Roof Hilton Head Island is 1 mile from Shelter Cove Mall and 2 mi from the luscious Hilton Head beaches--close to championship golf courses, tennis courts, a water park, and marinas. 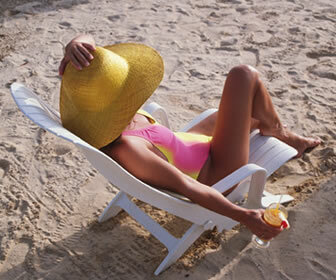 For a complete listing of Motels & Inns on Hilton Head Island click here.